Muslim Brotherhood leader Mohammed Morsi, if still Egyptian president, would have conquered Israel by now, a Palestinian Arab preacher insisted on the Temple Mount earlier this month. 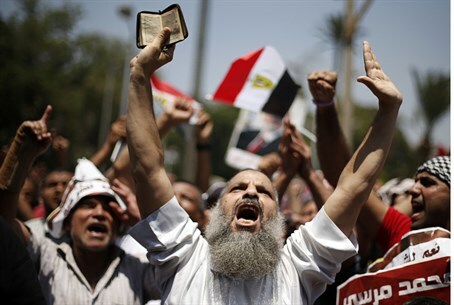 The Middle East Media Research Institute (MEMRI) revealed Sunday a clip of preacher Issam Amira lamenting the change in Egyptian regime in a July 1 sermon on the Mount. There, he insists that if Morsi would have murdered "collaborators," Egypt would "have been all the way to Zikhron Yaakov [a city just south of Haifa - ed.] by now." Morsi was ousted in 2013. "The problem is that under normal circumstances, a soldier does not take action unless he receives orders," he explained. "It is called “military hierarchy.” There is a commander, beneath whom there is a lesser officer, and so on, with the soldier at the bottom. Unless there are orders, the soldier does not act." "Without orders, there can be no fighting," he continued. "If a soldier receives orders to fall back, he has no choice but to comply, or else he is court martialed and executed for disobeying a military order. Hence, the solution is to replace the commanders of the armies." "If Morsi, when he came to power, had arrested 60-70 officers from among the American collaborators in the military, and hanged them from the gallows, or even executed them in secret, and had replaced them with pure military commanders, the Egyptian army would have been all the way to Zikhron Yaakov by now," he added. He then made a few predictions about Islamic State (ISIS) in Egypt. "They shall destroy the Jewish entity, and all the aspects of sovereignty that they have established, but I do not think that the Islamic army will destroy everything that they have built – the settlements, the airports, and the factories," he said. "Allah willing, these will be taken as booty by the Muslims."